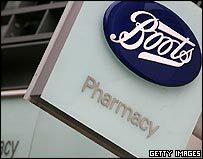 Boots is to merge with rival retailer Alliance UniChem in a £7bn ($12bn) deal, creating one of Europe's biggest drugs, beauty and healthcare groups. BBC News takes a look at the two companies which plan to shake-up the British - and European - pharmacy industry. Boots is one of Britain's most recognisable High Street names. Along with the likes of Marks & Spencer and WH Smith, it is a hugely trusted retail brand with a thoroughbred history. But the Nottingham-based company has fallen on hard times in recent years, faced with increasingly fierce competition from supermarket giants Tesco and Wal-Mart owned Asda. Both supermarkets have been targeting Boots' core toiletries and over-the-counter medicines markets, grabbing market share from the chemist. Profits at Boots fell 11% last year and the company has warned of "difficult" trading for the current year. The company can trace its history back to 1849, when John Boot opened a herbalist shop in Goose Gate, Nottingham. After his death, Mr Boot's widow Mary and son Jesse took over the running of the firm and in 1883 Boot & Co was formed. During the First World War, Boots supplied vermin powder and anti-fly cream to British soldiers in the trenches, while it was a source of penicillin and saccharin for troops during World War Two. Although firmly established as a British company, Boots was for a time owned by the United Drug Company of America during the inter-war years. The company splashed out £900m in 1989 to diversify its business with the takeover of Ward White, owners of Halfords and the Payless DIY chain. Analysts were widely sceptical of the move, and Halfords and Payless were later sold off. Boots' boss Richard Baker recently cut the price of core products in a bid to halt a decline in sales and fend off competition from supermarkets. The company operates 1,400 pharmacies in the UK and employs 68,000 staff in the UK. It reported profits of £481m in 2004-05, on sales of £5.4bn. Although arguably a lesser known High Street name - at least in Britain - Alliance UniChem is a major player in the European pharmacy sector. It describes itself as a "truly pan-European organisation...with the aim of improving the delivery of healthcare products and services to pharmacists and patients across Europe". Alliance UniChem operates the third largest pharmacy network in Europe, running more than 1,250 outlets in the UK, Norway, the Netherlands and Italy. Most of its UK stores are situated close to hospitals and doctors' surgeries, in contrast to Boots outlets which are mostly based in shopping centres and High Street locations. The company was formed in 1997 through the merger of Alliance Sante SA and UniChem Plc. Quoted on both the London and Paris stock exchanges, Alliance UniChem was promoted to the UK's top-flight FTSE 100 index in 2002. Earlier this year the company dropped its Moss Pharmacy brand, replacing it with the Alliance Pharmacy. 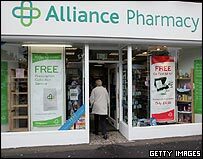 In May, Alliance UniChem bought Northern Ireland's largest independently owned pharmacy chain Bairds for £81m. The company, which whose corporate headquarters are in Weybridge, Surrey, employs 33,000 staff. It reported profits of £234m in 2004, on sales of £8.8bn.